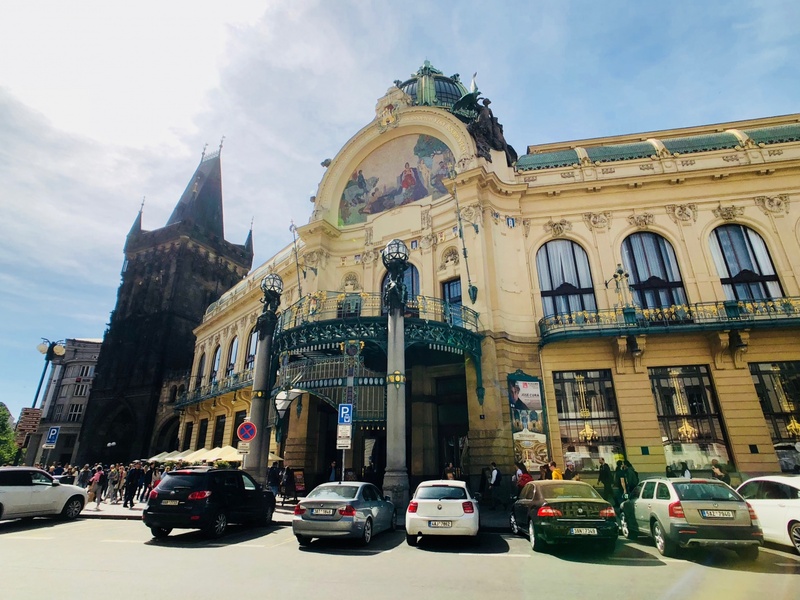 A few months ago, a friend asked me if I could put together a presentation on Prague for the media company HBO, which had established a regional HQ here. The presentation would introduce the city to new employees moving here from outside of Prague. “Be funny,” he said, “but give them information to help them understand the city.” I thought about it for a while and then it came to me: architecture. Prague’s story is written on its buildings, and if you can’t decipher the text, you’ll never get the plot. I’d been meaning to publish a primer on Prague architecture for a while, so here goes. What follows is a mash-up of that presentation and research for Lonely Planet’s guide to Prague & the Czech Republic. I had so many photos, I had to break the post into two. This week, I get into Secession/Art Nouveau, Cubism, Functionalism, and Communist-Era works. In my first post, last week, I covered historical forms from Gothic all the way up to 19th-century neoclassical. Top Photo: Part of the fun of Prague architecture is noticing the contrasts. Here, the world's only 'Cubist' lamppost, from 1911-13, stands in front of the entrance to the 14th-century Gothic Church of our Lady of the Snows, just a few steps off of central Wenceslas Square. Photo by Mark Baker. 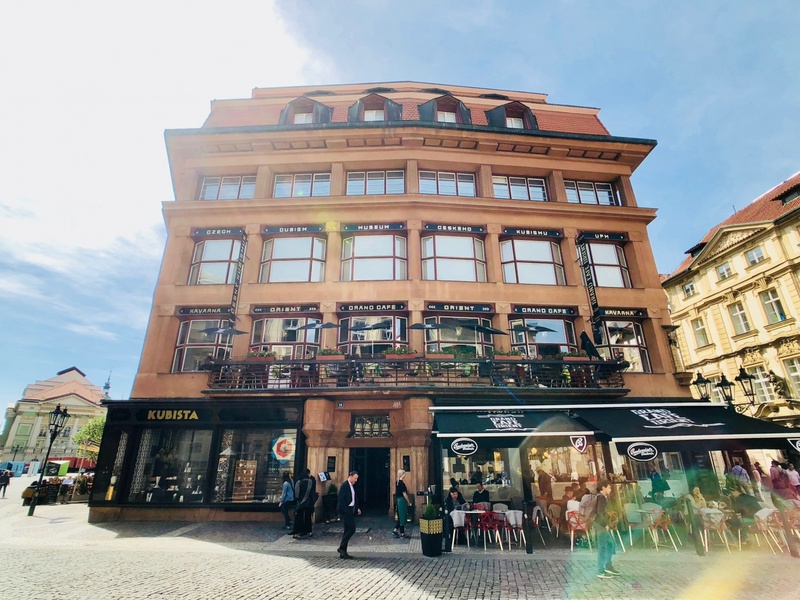 Posted in Diversions, Life In Prague and tagged Architecture, Art Nouveau, Cubism, Czech, functionalism, modern, Prague. In the late-19th and early-20th centuries, architecture became closely entwined with national identity. 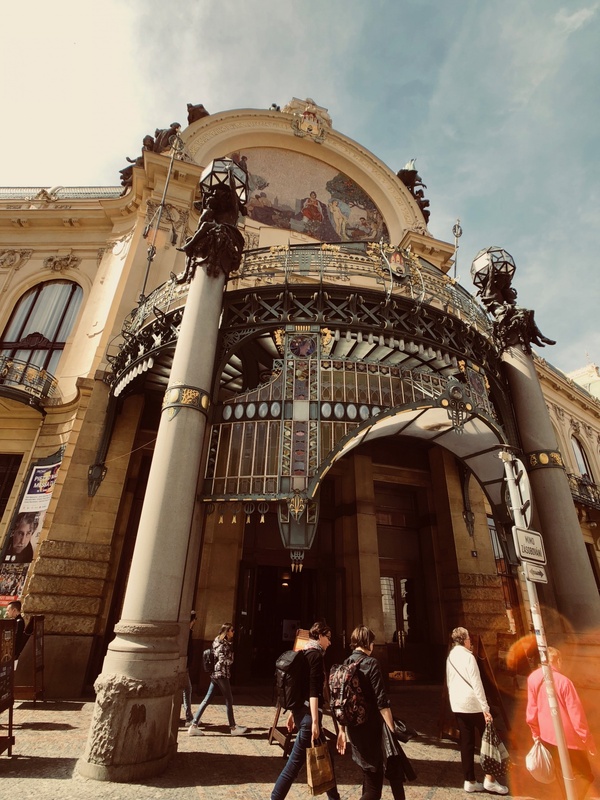 With Parisian-style Art Nouveau, as embodied here at Prague's Municipal House, the Czechs found a style to express -- at least briefly -- their national aspirations. Photo by Mark Baker. The late-19th and early-20th centuries brought some much-needed fresh experimentation after sterile neoclassicism. The villa of Jan Náhlovský from 1907, in Bubeneč, exhibits a kind of Czech 'Arts & Crafts' style. Photo by Mark Baker. 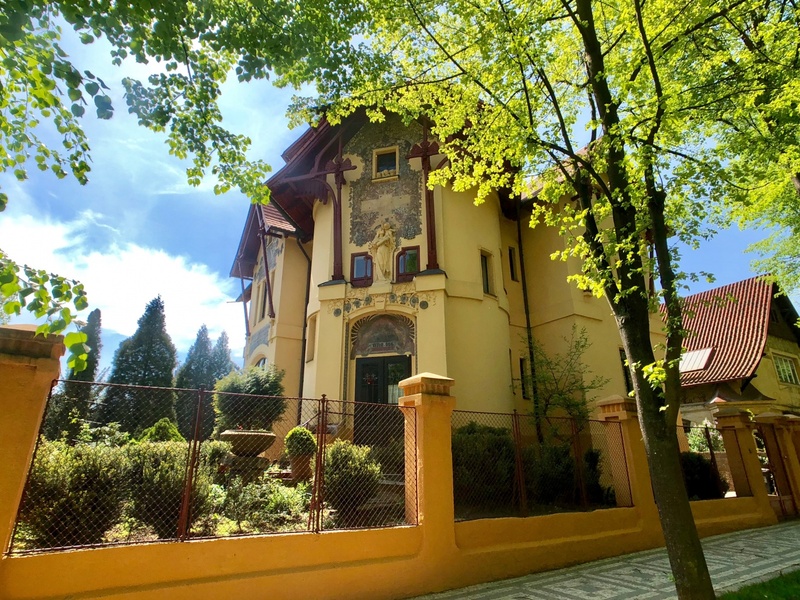 I ride my bike past this house, the old villa of Czech painter and architect Karel Vítězslav Mašek (1865-1927), nearly every day. I love the playful Art Nouveau facade. Photo by Mark Baker. We ended last week’s post on historical architecture somewhere in the 19th century, with Neoclassical. This was a backward-looking style, much in favor at the Hofburg in Vienna at the time, that assumed the best of architecture had already been invented and the future would hold no great aesthetic breakthroughs. It was a kind of Francis Fukuyama “End of History” moment for architecture. By that, I mean it was similar to the way Fukuyama had argued after the Cold War that man's political evolution had come to an end, and that the future would bring nothing more than a bland, but steady Western-style democracy. And just like Fukuyama’s pronouncements look ridiculous now in hindsight, so too do the views of those who pushed Neoclassical at the time. It wasn’t the end of architecture, but just the beginning. 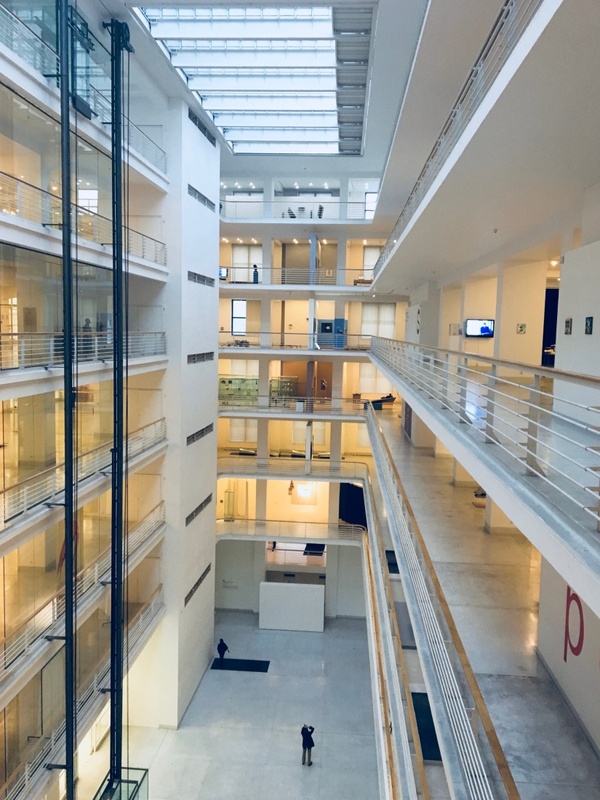 Ironically, Vienna served not only as a force for conservatism in architecture at the time, but also a source of inspiration for younger architects looking to experiment in new ideas. At the end of the 1890s, a group of leading Austrian and other European artists and architects (many from Central Europe) established the Viennese Secession, a movement that pledged a break with the prevailing historicist styles. The Secession was immensely influential in Prague, which after all was still then part of the Austro-Hungarian Empire. In the hands of talented Czech architects like Jan Kotěra and his student Josef Gočár, the style evolved from a kind of Czech-version of “Arts & Crafts” (a style that took inspiration from traditional folkways) to classical Art Nouveau and even to experimentation in Cubism. Both “Secession” and “Art Nouveau” embody similar ideas of emphasizing beauty and using flowing lines and highly decorative elements (and the terms are sometimes used interchangeably), but they’re not exactly the same thing. Secession buildings tend to be more geometric and understated, while Art Nouveau – in their Parisian incarnation – goes more for the curvaceous and florid. Prague has plenty of examples of both. The elegant townhouses of the former Jewish Quarter of Josefov, built in the first decade of the 20th century, are more in the vein of Viennese Secession, while the attention-grabbing facades of the Municipal House and the Grand Hotel Evropa are clearly examples of classic Art Nouveau. 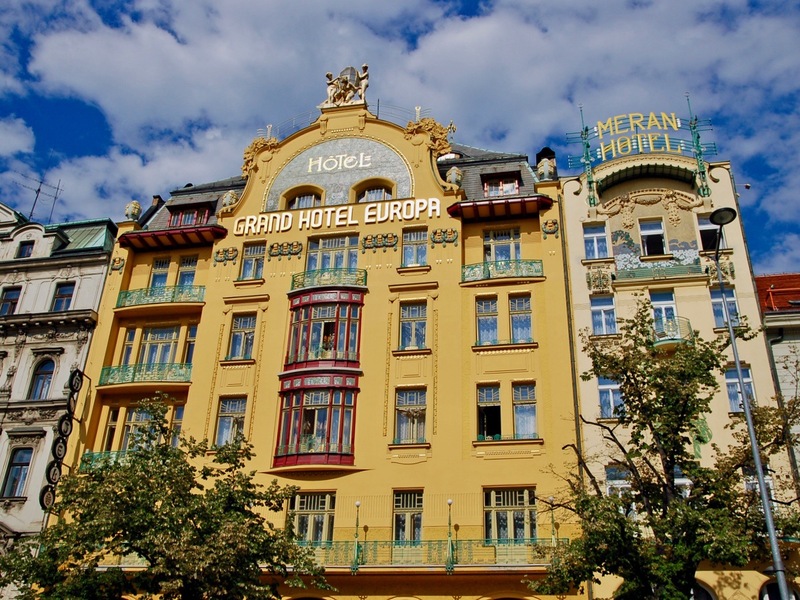 The glorious Hotel Evropa on Wenceslas Square got its gleaming Art Nouveau facade in 1905. It's been closed for years for renovation. Photo by Mark Baker. The city's finest expression of Art Nouveau is the Municipal House. 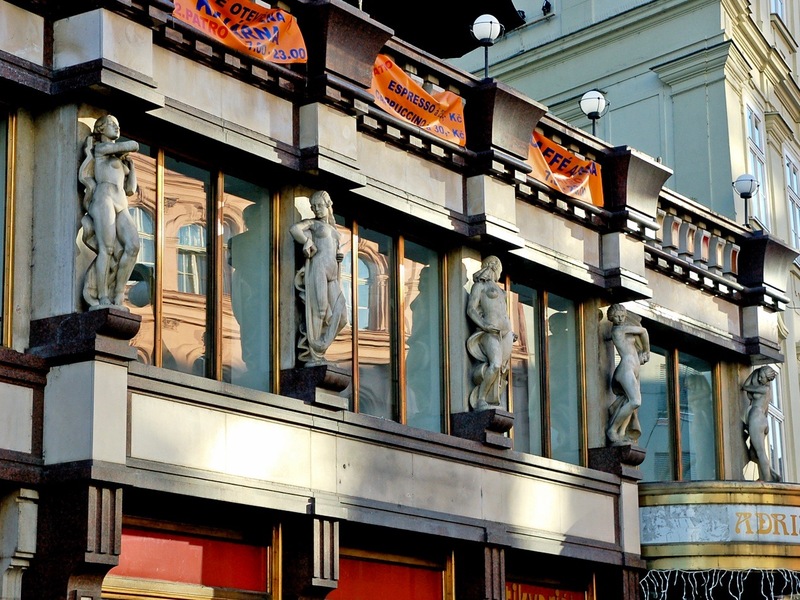 Every aspect of the building's decoration was designed by leading Czech artists of the time, including Alfons Mucha. Photo by Mark Baker. 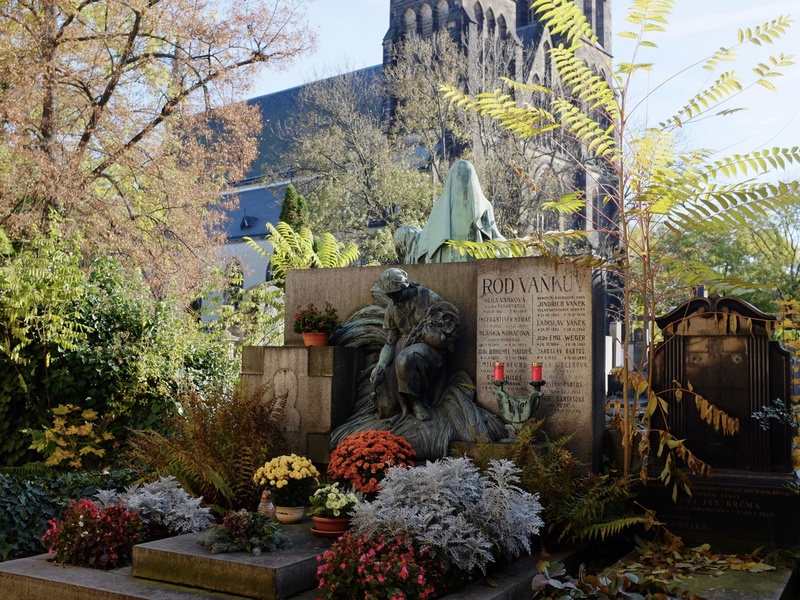 The various architectural styles are also reflected at Prague's cemeteries. The national cemetery at Vyšehrad is a celebration of Art Nouveau. Photo by Mark Baker. 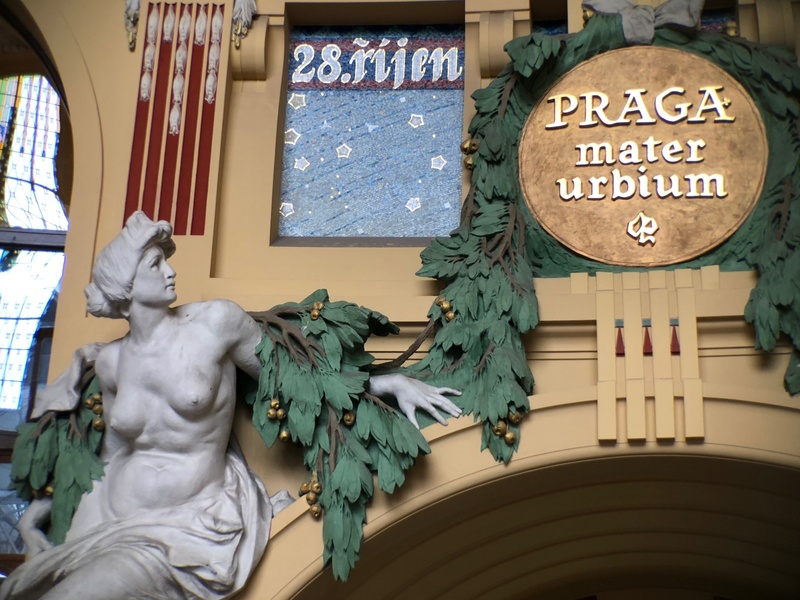 The historic core of Prague's main train station display the strong influence of Parisian-style Art Nouveau. Photo by Mark Baker. By the time the Municipal House was finally finished (it took six years to build), in 1912, it was already out of fashion, and architects were on the hunt for ways to tone down Art Nouveau’s decorative excesses. The next style to capture architects’ imagination, Cubism, was short on actual buildings (there are just a few scattered around town – and one lamppost! ), but big on impact. Indeed, Cubist architecture is considered to be unique in Prague. 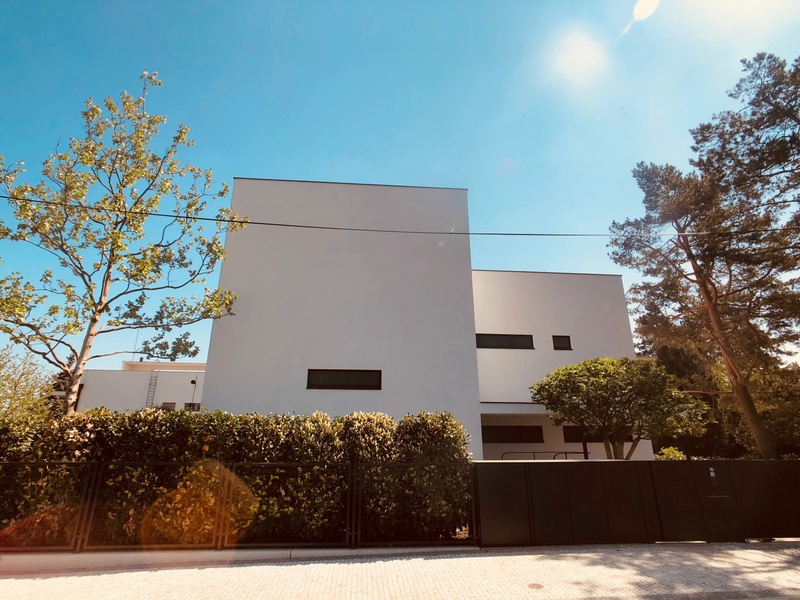 As the name suggests, Cubist architects took inspiration from the painting style of the same name, popularized by Pablo Picasso and others, and applied the tenets to buildings. The main idea behind Cubism as an artistic approach is to deconstruct and re-aggregate objects so as to see them in their totality. The idea works on canvas (and even as a decorative style for cool-looking lamps and vases), but it’s not so simple with architecture. In practice, Cubist architects -- such as the influential Josef Gočár – made use of repetitive geometric forms like triangles and polygons on building facades to create structures that appear as if they’re built from crystals. The most notable building is Gočár’s “House of the Black Madonna” in Old Town (also home to the city’s Cubist museum). 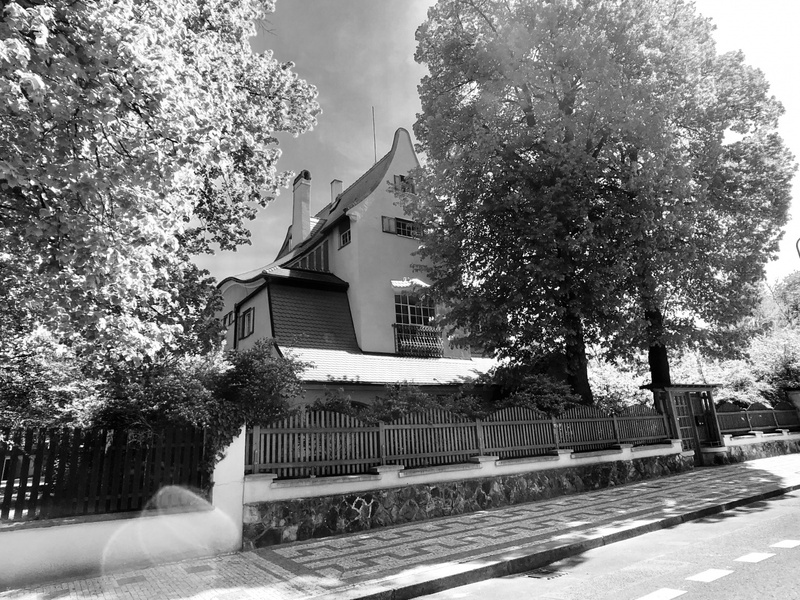 Fans should check out a small group of Cubist villas designed by Josef Chochol along the Vltava River, below the Vyšehrad citadel. After World War I, Cubism evolved into a related style, Rondocubism, that took the angular facades a step further and added color and hyper-realistic decoration. Rondocubism coincided with the emergence of the newly independent Czechoslovak state, and the most important buildings, such as Gočár’s Legio Bank Building, incorporate starkly nationalistic elements. A more “secular” (if that’s the right word) example of Rondocubism is the Adria Palace from 1923-24, not far from Wenceslas Square. Rondocubism remained influential throughout the 1920s, and a toned-down echo of the style’s telltale geometric forms are clearly visible in the facades of suburban apartment blocks and housing projects built during the decade. The House of the Black Madonna in Old Town is one of only a handful of "Cubist" architectural buildings ever built. It dates from 1911 and was designed by Josef Gočár. Photo by Mark Baker. The Legio Bank Building, designed by Cubist architect wunderkind Josef Gočár in 1921, is the purest example of Czech Rondocubism. The ornate facade depicts the Czech Foreign Legion and its battles in Russia during WWI. Photo by Mark Baker. 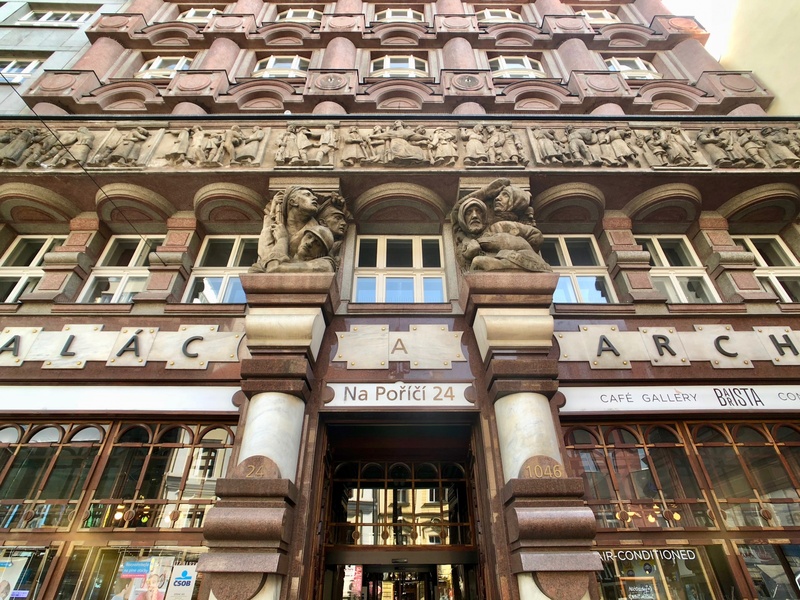 The Adria Palace, a few steps from Wenceslas Square, dates from the early '20s. The detailed but sober decoration on the front marks it as classic Czech Rondocubism. Photo by Mark Baker. Faint echoes of Rondocubism can be seen here in public housing dating from the 1920s in the outlying district of Bubeneč. Photo by Mark Baker. In step with the “Bauhaus” movement underway in neighboring Germany, younger Czech architects adopted the mantle that “form should follow function” – in other words buildings should look like what they do. 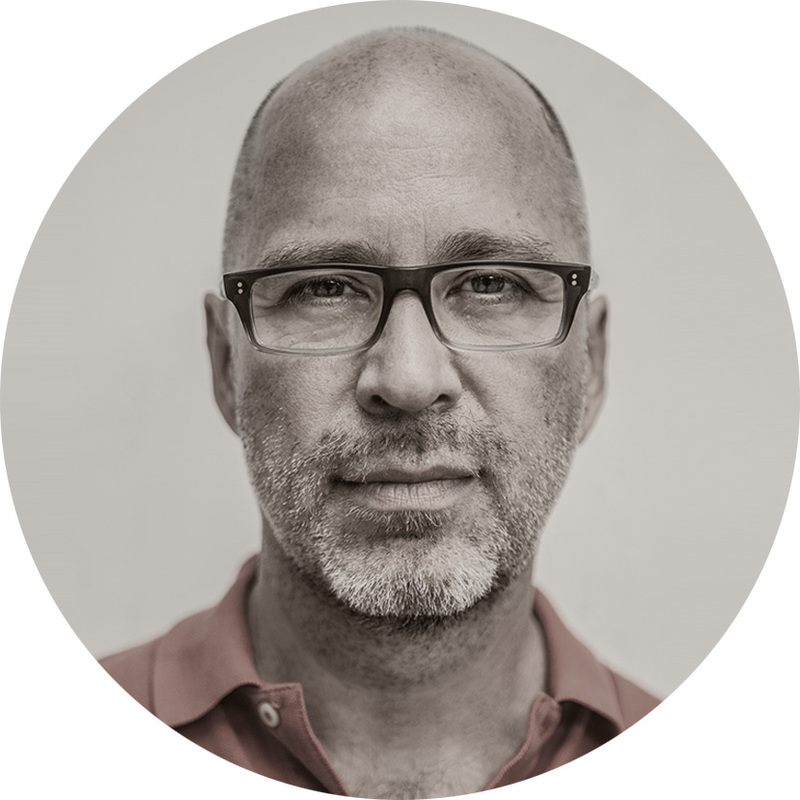 It was an attempt to ground a theory of aesthetics in authenticity, and Functionalism continues to influence architects to this day. Not surprisingly for a style that rejected ornament, Functionalist buildings -- on the outside at least -- often appear stark and minimal. For people who don’t get it, there’s a distinct feeling of “what’s the big deal?” Functionalist buildings derive their oomph in more subtle ways. The best buildings play with light and symmetry, and make use of high-quality materials like fancy marble and hardwoods. 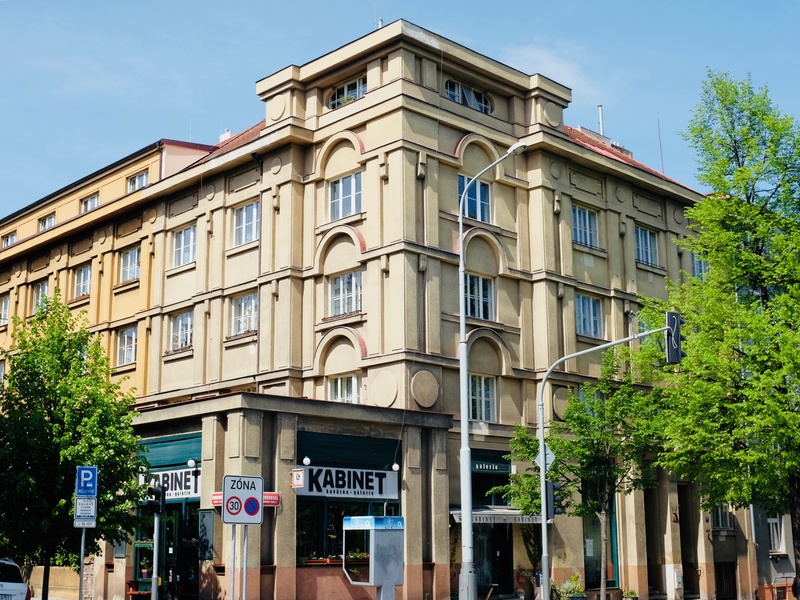 Notable functionalist buildings in Prague include the Hotel Juliš on Wenceslas Square, the Veletržní palác in Holešovice, and the Adolf Loos's own Villa Müller in the suburb of Střešovice. The Hotel Juliš (left) from 1932 is one of a handful of Functionalist buildings on central Wenceslas Square. Note the architectural diversity; the hotel stands next to a smaller 19th century neo-Renaissance palais (right). Photo by Mark Baker. 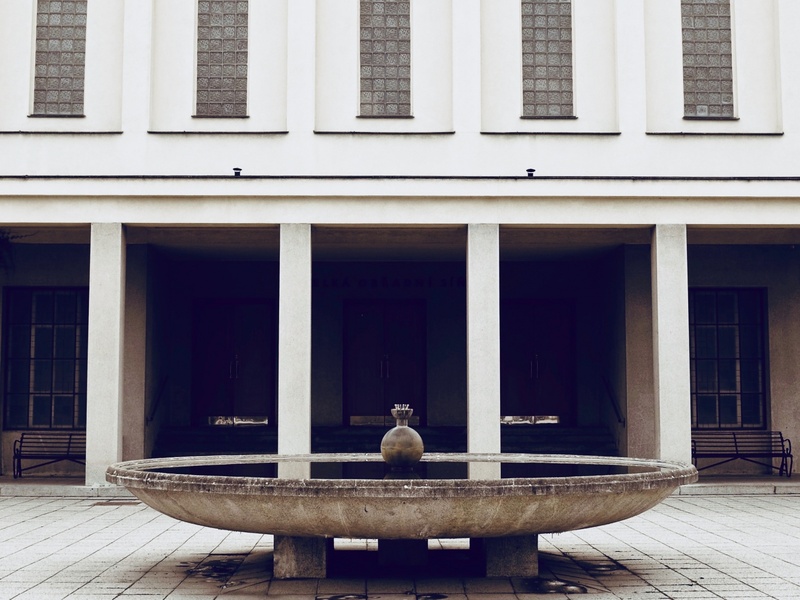 The Functionalist crematorium in Prague's eastern Strašnice suburb was built in 1929 and is characterized by clean lines and spare decorative elements. Photo by Mark Baker. A classic Functionalist villa from the early 1930s -- after renovation -- in Prague's Baba estate, in the district of Dejvice. It's still used as a private home. Photo by Mark Baker. The clean, unadorned lines of the Functionalist Veletržní palác art museum in Prague's outlying district of Holešovice. Photo by Mark Baker. As regular readers will know, I’m transfixed by buildings built during the Communist period from 1948 to 1989 and have written several posts on that architecture. Rather than a long discourse here, I’ll restrict myself to a few observations and favorite buildings. 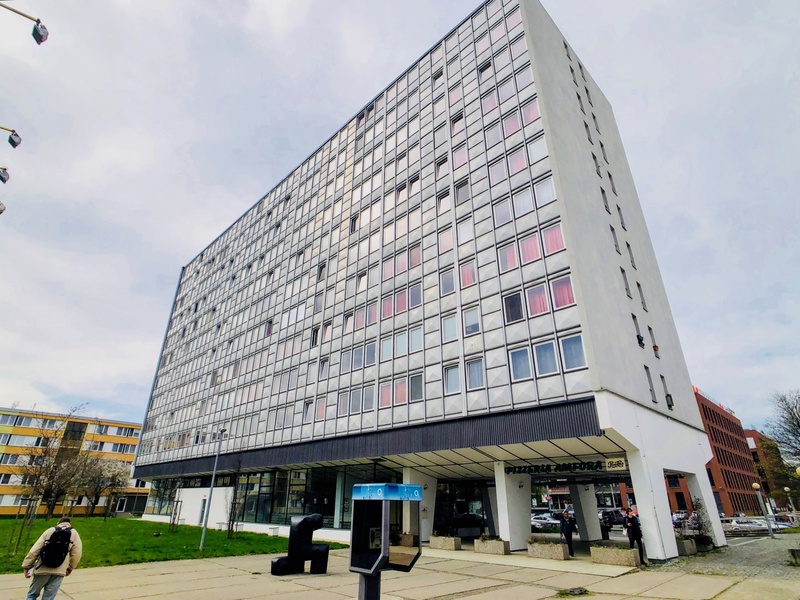 For more info, click here for a discussion of the controversial 1970s “Brutalism” Kotva Department Store, or here for a post on the late-1960s “Brussels’ Style” train station in the Moravian city of Havířov. The term “Communist-era” masks an amazing amount of diversity found in buildings built over a relatively compact period of just four decades. Part of the appeal of buildings from this time is that the architects were obviously wrestling with the pretzel-logic of Communist orthodoxy (the primacy of the working class, a rejection of capitalism), while also responding to and reacting to the reigning international styles of the day, like High Modern, Futurism, and Brutalism. The result is part sublime and part, well, awful. To get a taste of some of the diversity for yourself, compare the grand Hotel International in the Prague suburb of Dejvice, which dates from the 1950s and typifies the Socialist-Realist style of buildings you might find in central Moscow, with later, much-less-ornate buildings from the 1960s and ‘70s. Communist-era architecture was used especially in the construction of housing projects, schools, institutes, and hospitals. Critics say the architecture employs the stark minimalism and cookie-cutter designs of Functionalism, without the use of high-quality materials to redeem them. 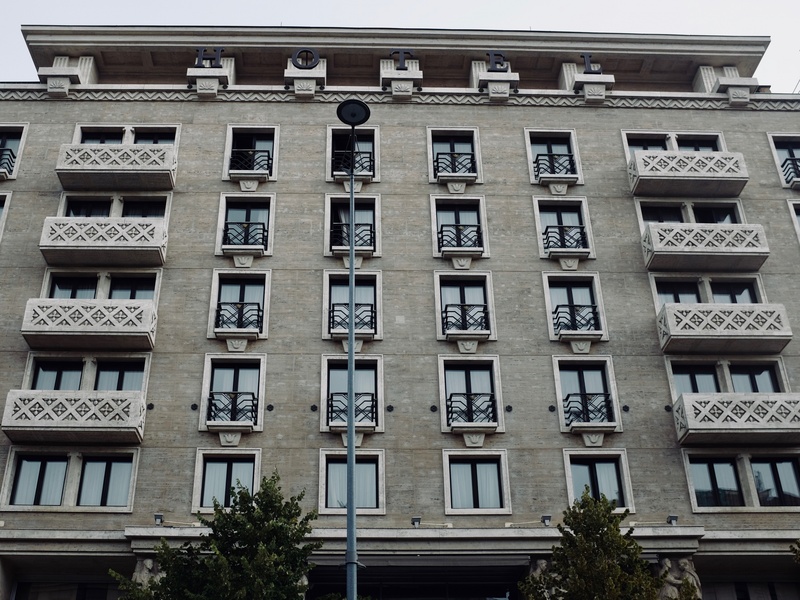 Supporters – and there are many – argue the buildings are a genuine expression of the prevailing political and economic conditions at the time and should be appreciated by that standard. This was more or less the line taken by Prague’s Museum of Decorative Arts in their groundbreaking 2018 exhibition on Communist-era public housing. They identified six distinct building styles over the period, with plenty of examples in Prague where you can still see the architecture. I wrote about it here. You can find descriptions and addresses for many of the buildings I've mentioned here on the extensive Lonely Planet Prague website. While in Prague, look out for the hardcover book "Famous Prague Villas," which you can sometimes find in bookstores or museum bookshops. It's a fascinating overview of the city's most famous or noteworthy modern buildings. 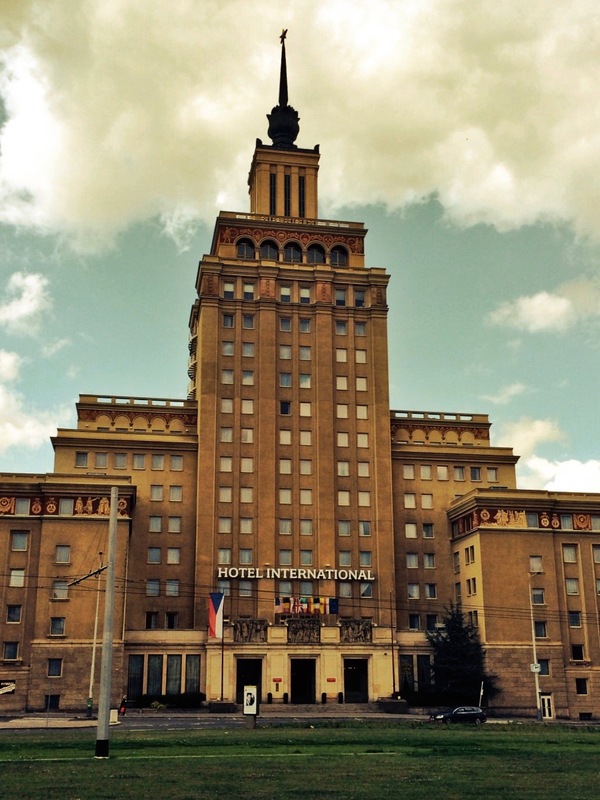 The Hotel International from the early '50s is perhaps Prague's clearest example of Stalinist, Moscow-inspired Socialist-Realism. Photo by Mark Baker. 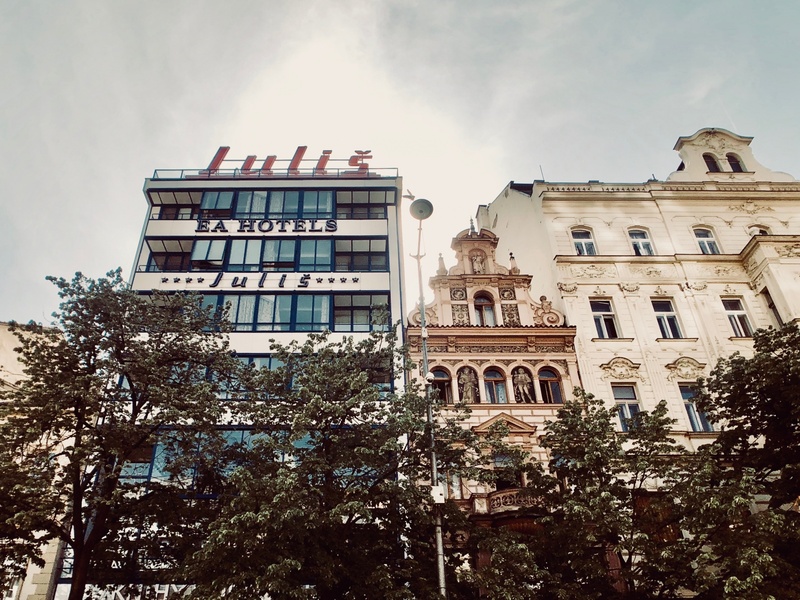 The subdued, dignified Socialist-Realist facade fronts the 1950s' Hotel Jalta on Prague's Wenceslas Square. Photo by Mark Baker. 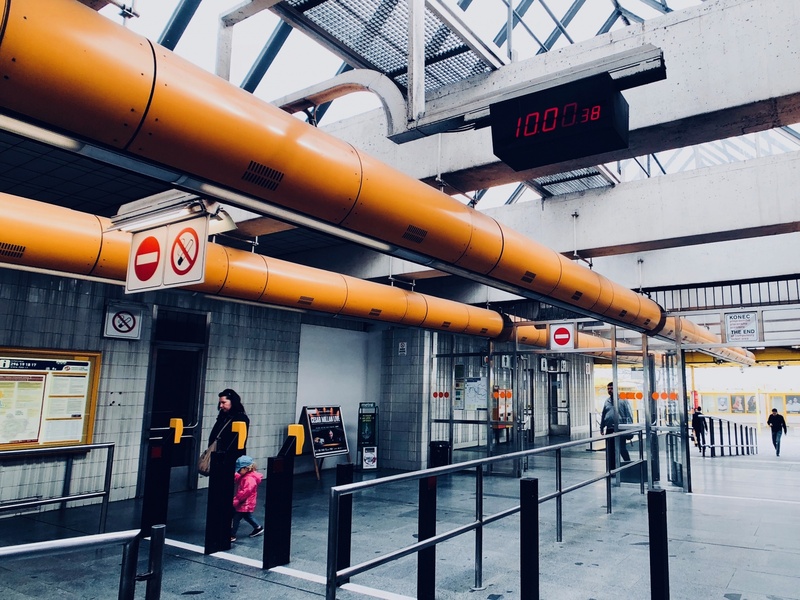 Brutalist architectural elements in the form of exposed, orange-colored ceiling ducts flow through Prague's Invalidovna metro station. Photo by Mark Baker. A typical 1960s Communist-era building from Prague's Invalidovna public housing estate. Photo by Mark Baker. A friend and I spent 12 days in Prague in 2015. We are both keen amateur photographers and the art nouveau style became our favourite. A lot of memory cards were filled with it.